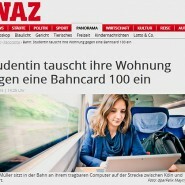 Last spring, 23-year-old German student Leonie Muller had a disagreement with her landlord and decided to move out…to the train. Leonie told the Washington Post that she realized she could save $70 a month if she lived on the train instead of in an apartment. 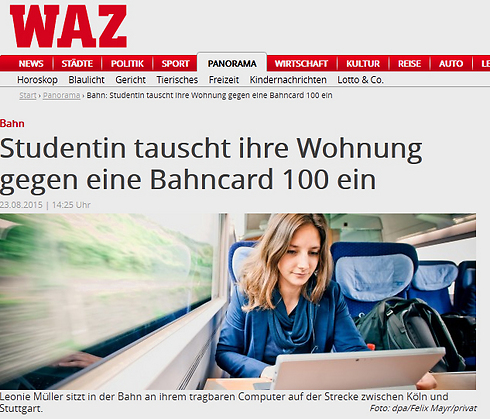 So she bought a ticket which enables her unlimited train travel around Germany. She washes her hair in the bathroom. She prepares her papers and studies for tests racing up and down Germany. Summer vacation is feeling veeery long to me right now. My house is crowded and messy and, like Leonie, I would REALLY enjoy a vacation right about now. But the truth is, I would enjoy a vacation for a day or a two or maybe a week. I would miss my crowded and messy home and everyone in it. And out of all the resorts, hotels, and trains in the world, this crowded, messy place is the place I’d most want to be. I wonder how long she can do it without needing a place to call home. Okaaay. Kind of weird. Does she shower? What did she do with her stuff? I guess if you don’t get carsick, and can sleep on seats, it could work – if you’re single and adventurous. I wouldn’t be able to do it. I need my own bed, my own kitchen, and some privacy.